New York City is changing from a finance dominated economy to a more diverse technologic and Googlization based economy. New York City's finance jobs have declined by 5.9% over the past few years while the city now has 52,900 people working in the information-technology sector, up 28.7% from 2007. The technology shift to "Googlization" is the major growth sector propelling job growth specifically in science, technology, engineering, and math (STEM ) based businesses. New universities and technology programs are paving the way for Google-type industries to develop and expand. These innovative engineering based developments are potentially eligible to receive Research & Development (R&D) Tax Credits for qualified activities. The following chart presents New York City's future economic power as it experiences a shift from a primarily financial industry based economy to a more balanced technology driven economy. Tony Wagner, Harvard education specialist, makes the point that if you need a job in today's economy you have to create your own job . He argues that every child should not become "college ready" but "innovation ready" and needs to be prepared to add worth to whatever they do. He maintains that it matters, technology-wise, what you can do with what you know and that the ability to innovate by creatively solving problems, bringing new possibilities to life, thinking critically, communicating, and collaborating drastically supersedes academic knowledge. New York City's major universities including Cornell/Technion, Columbia University, and NYU-Poly are increasingly focused on innovation opportunities for college students as follows. Cornell University and the Technion-Israel Institute of Technology recently partnered up to create a superior applied science and engineering campus in New York City, a result of winning a vigorous NYC competition proposed by the Mayor. They were awarded with $100 million in cash and $300 million in real estate to go towards the development of an applied sciences campus. The combination of collaborating with such a prominent foreign university as well as obtaining $350 million in private financing from billionaire Charles Feeney was impressive to officials. As of now, the program is being housed at Cornell Tech's temporary campus in a space donated by Google in Chelsea in New York City. In 2017, the graduate campus will move to its permanent home on Roosevelt Island. This merger will combine Technion's global leadership in technology transfer with Cornell's connection to NYC's up-and-coming technology sector. 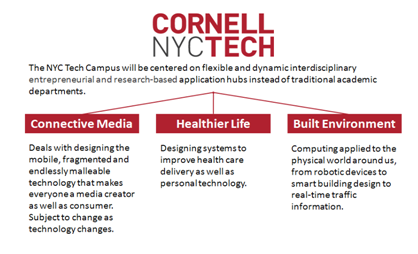 The initial industries to be fostered by Cornell-Technion are presented below. Columbia University, perhaps in response to the developing competition, is greatly increasing its applied science curriculum. It will be significantly expanding its engineering school, the Fu Foundation School of Engineering and Applied Sciences . Columbia will receive $15 million in financial assistance from New York City. The city's investment in Columbia is projected to result in $4 billion in economic growth in the city and 200 new small businesses, creating thousands of jobs and economic activity. After the expansion, Columbia plans to expand its engineering faculty by 40 percent. As a result they will take on new graduate students, which will add about 400 graduate students to the already existing 1,500. The creation of Columbia's Institute for Data Sciences and Engineering will spur growth in New York City. New York University and Brooklyn's Polytechnic University, with their merger, pioneered the integration of general university studies and the applied science and research curriculums. For Brooklyn Polytechnic University, it would help expand entrepreneurial and innovative opportunities for its student body and advance their role in New York. The merge will strengthen NYU-Poly's ability to recruit students with interest in STEM in New York and around the world. The merger will better prepare STEM students to compete in the global economy by integrating comprehensive engineering education and management, medicine, social sciences, and humanities. This fusion of innovation should enhance New York City's future economic progress. The completion of the expansions of Cornell/Technion, NYU-Poly, and Columbia University will increase the number of full-time engineering graduate students in the five boroughs by 120%, according to the New York City Economic Development Corporation . This will pave the way for the expansion and development of STEM industries and create more innovative thinkers, new jobs, technologies, and industries in New York City. This will undoubtedly lead to an increase in the progression of New York City's economic growth. These university-to-business technology innovations would highly benefit from Federal Research and Development Tax Credits.